However it used to be a bit short on water fun options, at least for the very young. The Ovens River runs through the town and is very popular in summer with teenagers and older swimmers, being well equipped with a couple of water slides and a dammed area. Young children only really had a pretty tired little paddling pool on the river bank, or the option of a paddle in Morse's Creek, which runs into the Ovens. 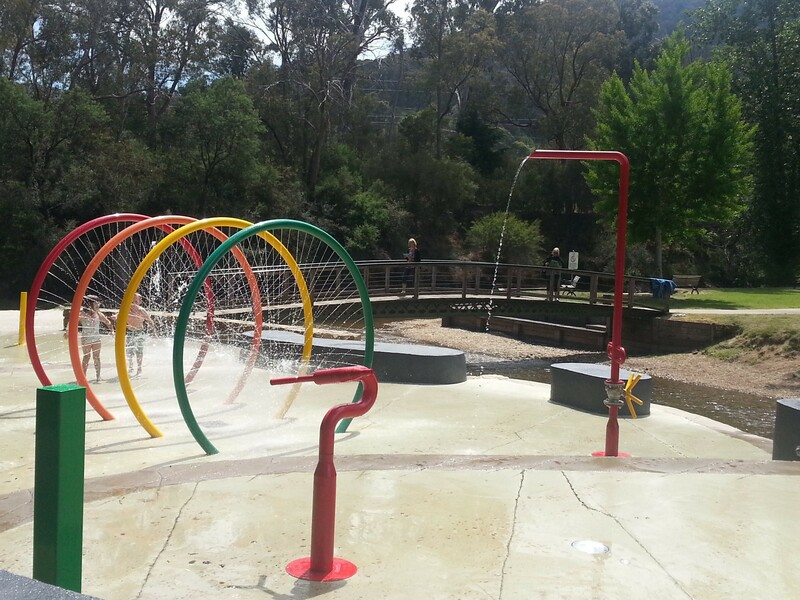 The Alpine Shire has just opened a fantastic addition to the wonderful recreation area that encompasses the swimming hole and water slides, and the nearby adventure playground in Howitt Park - a Splash Park in Centenary Park, on the bank of Morses Creek. 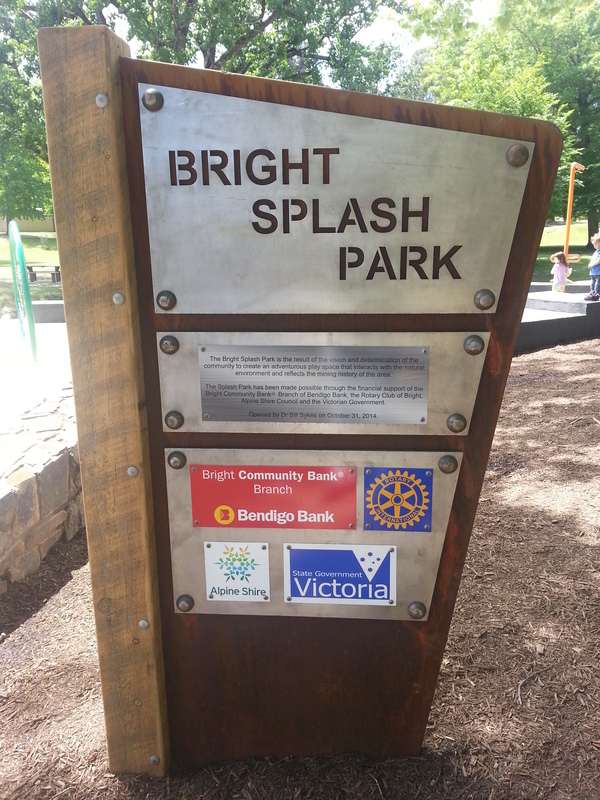 Nicely designed to fit in with the existing environment, and therefore easily accessible from existing walking paths and taking advantage of the shady established trees, the splash park is set to be hugely popular as the hot weather approaches. 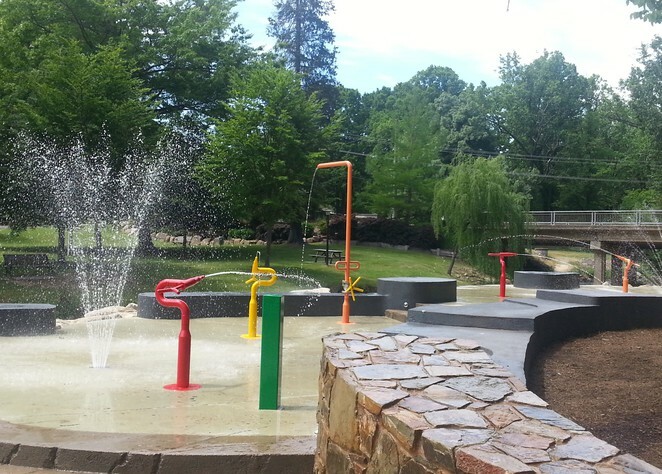 It's a sufficiently large area, allowing lots of room for lots of kids, and it provides plenty of resting areas when the little ones want to take a break, including a nice wooden platform which would be perfect for stretching out to dry. 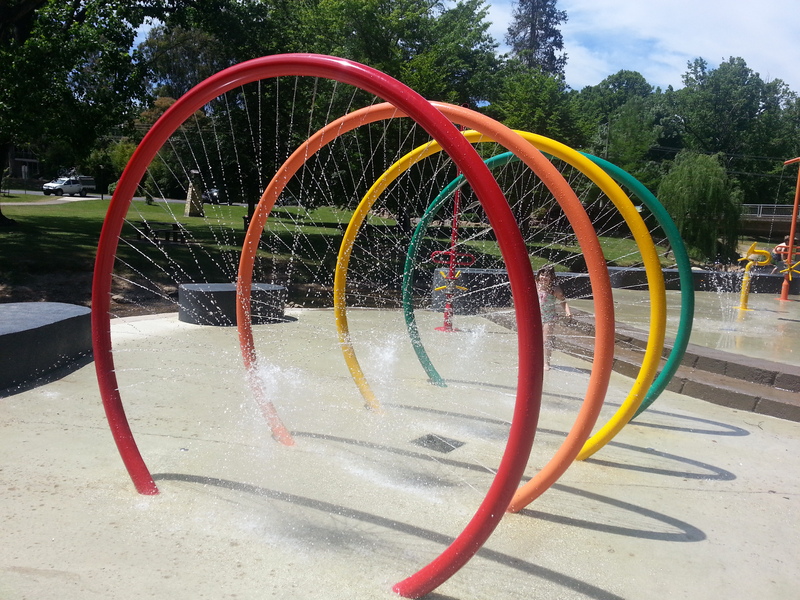 The fixtures are pretty familiar from suburban pools - brightly coloured water guns, in-ground fountains, bubblers,elevated pipes, a set of arches that create a water web, and of course a fantastic big dumper bucket. Everything except the dumper bucket goes on at irregular intervals. The dumper bucket slowly fills and thrilling flags the impending dump through the use of three rows of small holes drilled in the side of the bucket. 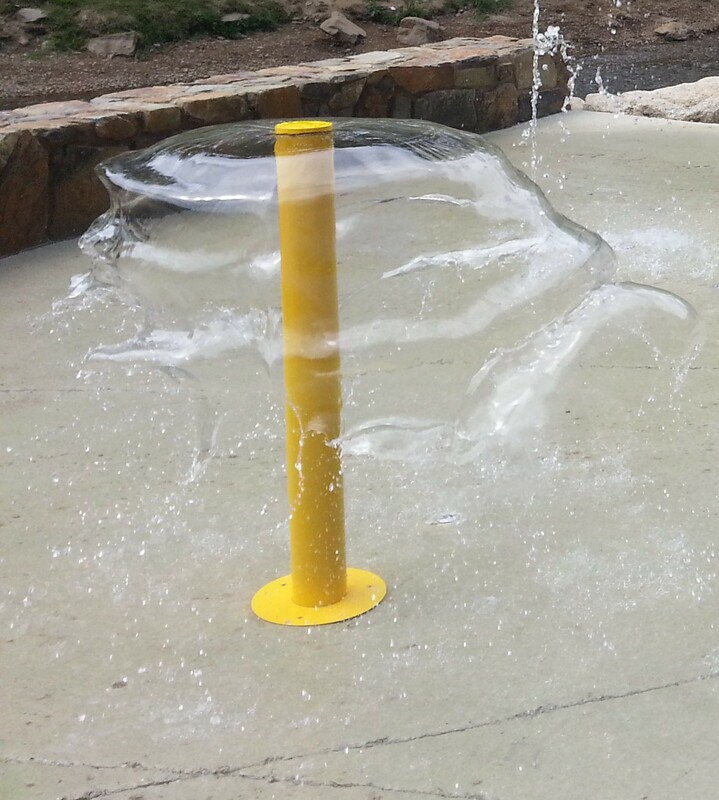 As the water level rises, it escapes out the holes, and my kids watched in rapt excitement as the first row leaked, then the second, then the third, then - MASSIVE DUMP! Fantastic. Watch out for the dumper! 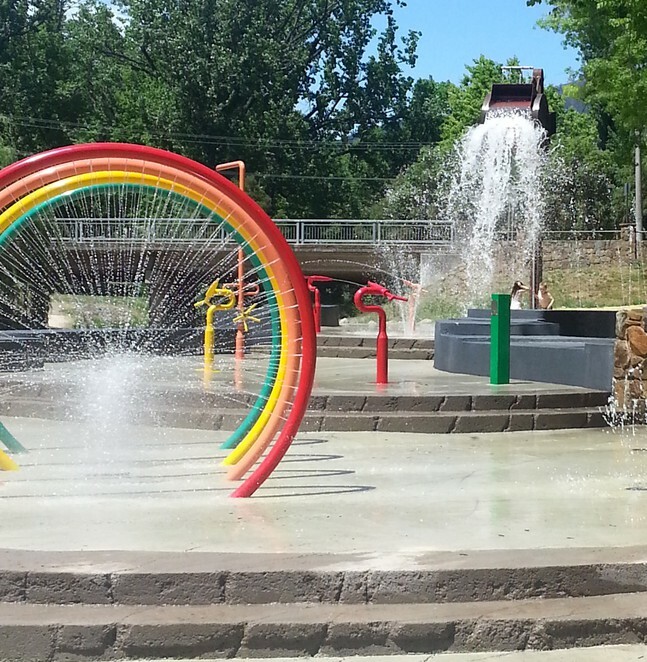 You can see that the splash park has been designed so that the three or four areas cater to slightly different age groups. At one end, the water features are gentler and better suited to younger kids. At the other end, where the dumper bucket looms, the features are a bit more aggressive and more fun for older kids. Morses Creek was dammed next to the splash park on the day we visited. 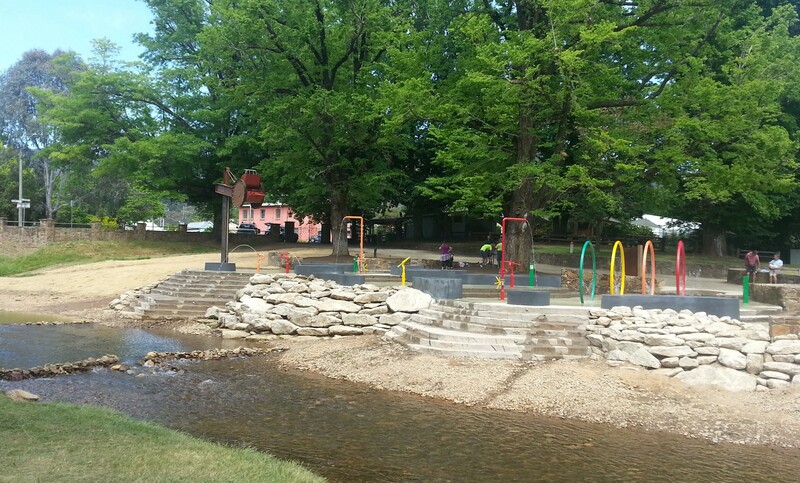 I don't know if that's a permanent part of the park, or was the initiative of one of the visitors, but I hope it stays - it's great to be able to walk into a contained area of the creek from time to time. Full credit to the Alpine Shire for investing in this great new facility, which is supposed to be based on a goldmining theme. I had previously used the toddler pool, which was pretty awful - full of toddlers in swimmer nappies (including mine) so the water quality probably wasn't the best, even though it had water running through to flush it. The splash park is a huge improvement, fitting well with the amenities in the area, and it's safer than the river or the creek for littlies. It has completed this area as a must-linger summer location for visitors to the town. In terms of safety - I suppose that will be tested over the coming Summer. The surface is textured concrete and pretty good. But commonsense applies - the more you run on a wet surface, the more likely you are to fall, no matter how slip-proof the area is. 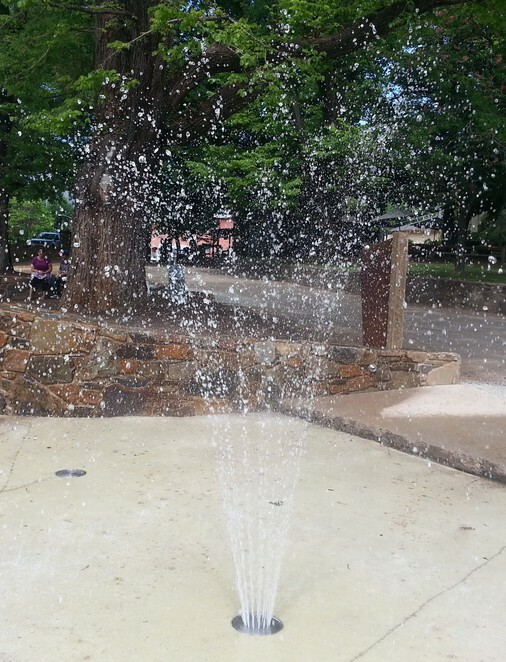 The water used is from a bore, so is not recycled and doesn't require treatment. It drains straight into the river. We're looking forward to visiting this splash park quite a bit during the warm weather. I wish waterparks were more common! 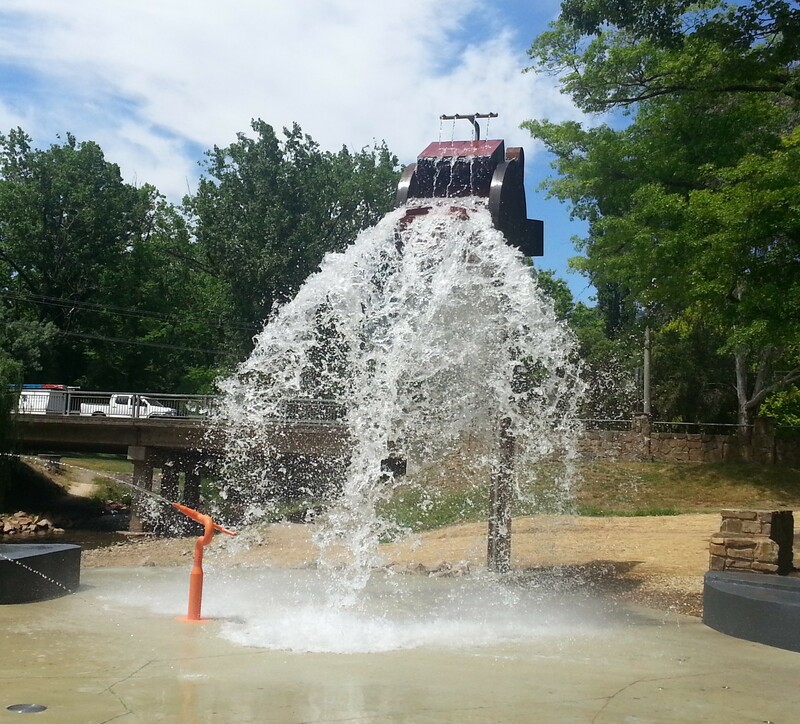 That looks ike a really fun water park, I like the water arches and bucket.